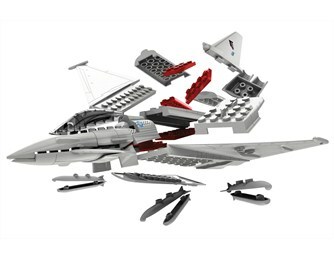 The Airfix QUICK BUILD range of models piece together using push-fit construction technology, are pre-coloured, come with a display stand and decorative stickers. They make for fantastic playable models that can interact with the major toy brick brands, and these brilliant new Airfix models look just like the real thing when built! This new way of building Airfix allows younger modellers to have fun at an earlier age (5+) and once they’ve built this collection they’ll be ready to move onto the Airfix Starter Sets (Age 8+). The Airfix QUICK BUILD range won Best New Toy in the "Hobby Category” this year at the London Toy Fair, awarded by the British Toy & Hobby Association (BTHA).